As we were digging out our Christmas decorations this year, we came across Our Christmas Tea Cup that reminded us to be thankful for all things in life-big and small. We are thankful for every one of you who have stayed with us since we opened in June 2008. 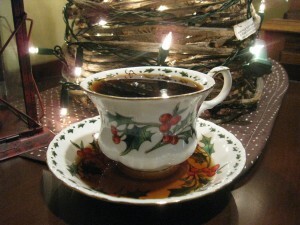 The Christmas Tea Cup reminds us of a poem that was written by John Paul Moore and published in the October/November 2009 issue of Reminisce magazine, page 52, and we wanted to share it with you. Read the poem and pour yourself a cup of tea. Be sure to make it overflow onto the saucer. Dwell on the good things that have been brought into your life this past year. As you decorate this Christmas Season, you may want to consider decorating with less and focusing on the real meaning of Christmas. My Christmas Tea Cup has overflowed! I’m reaping better that I sowed. And sometimes the goings’ tough. About the tough rows that I’ve hoed. Check back soon since our next blog will be sharing with you our German Pfeffernusse recipe. They are so good with tea and you may want to invite a friend over. This past June, Amil’s Inn Bed and Breakfast was blessed to have author, Vannetta Chapman and her husband as guests. Vannetta was in the area to complete research on the Amish community. Vannetta Chapman holds a BA and MA degree in English and has published over one hundred articles in Christian family magazines, receiving over two dozen awards from Romance Writers of America chapter groups. She discovered her love for the Amish while researching her grandfather’s birthplace in Albion, Pennsylvania. She published a novel with Abingdon Press called A Simple Amish Christmas in October of 2010. Her first Quilt Shop Murder Mystery, Falling to Pieces (Zondervan), will release in September of 2011. She currently lives in the Texas hill country. 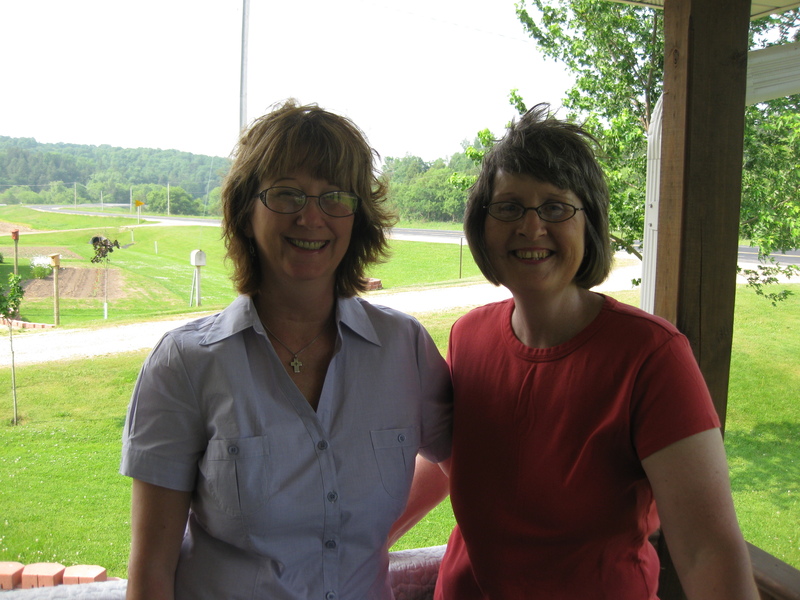 In the Amish community of Shipshewana, two women—one Amish, one English—reluctantly join forces for a short-term business venture. Neither is looking for friendship, but when the town’s newspaper editor is murdered, and an unexpected prime suspect is identified, the women form an unlikely alliance to solve the mystery. In this first book of a three-book series, author Vannetta Chapman brings a fresh twist to the popular Amish fiction genre. She blends the familiar components consumers love in Amish books—faith, community, simplicity, family—with an innovative who-done-it plot that keeps readers guessing right up to the last stitch in the quilt. For more information or to schedule an interview, you may contact her publicist, Katie Broaddus. Katie can be emailed at : Katie ( at ) katiebroaddus.com. You may also contact Vannetta directly at VannettaChapman (at) gmail.com. Here at Amil’s Inn Bed and Breakfast, we are waiting patiently for the delicate crocuses to thrust their heads through the icy, cold spring soil. There is some ice and snow still left on the north side of the slopes of the Kickapoo Valley. We are starting to get a few warm days but the nights are still cool. Many of our neighbors including the Amish are tapping maple trees to collect sap for cooking down to make homemade maple syrup. As we go about our daily tasks of preparing to garden and complete that much needed lawn work after a long, hard winter, let us not forget to take time from our busyness to enjoy a cup of tea and delight in the simple things of life. 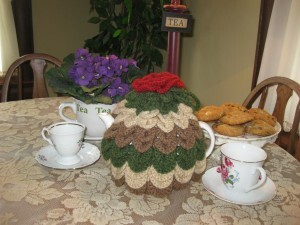 This past winter, I had a birthday and a dear friend surprised me with a beautiful crocheted tea cozy. So as you make summer plans for your week or weekend get-away, consider Amil’s Inn where you can sit back on our front porch, enjoy a cup of tea and some cookies and take pleasure in the simple things of life and if you are fortunate witness some Amish buggies going by!